Analytica offers professional products and solutions for the industry. Emphasis here is customer-oriented hardware and software solutions for the control and communication. The AnaGate hardware series connects PCs to individual communication protocols (e.g. I2C, SPI, CAN/CANopen, etc.) using the TCP/IP network protocol (Ethernet). 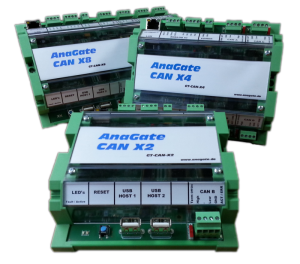 The new series AnaGate Motion is designed for use in industrial motion control applications and includes independent control modules as far as standard components for motor control with CANopen interfaces. Here on the AnaGate homepage you can find helpful information and support round around our hardware series. You can buy our standard products comfortably via osCommerce online shop. We provide completely new individual solutions or just adjustments and extensions of our existing standard products. Of course you can use also our contact form. The well-proven AnaGate Universal Programmer with integrated SPI and I2C interface is offered in a new version 2.0.